QUICK DRYING AND SUPER ABSORBENT-BOOMYOURS Microfibre towel made from high quality microfibres,dry up to 10X faster than normal terry cloth or cotton towels. These can hold up to 4X its weight in water! PERFECT MULTI-USE TOWEL: Great for traveling, backpacking, golf, beach, gym, home and many more! Tired of bulky towels taking up space in you sports bag, or trying to squeeze all of your essentials into your suitcase for your holiday? This Antibacterial Microfibre Sports Travel Towel is SUPER ABSORBANT, QUICK DRYING and ULTRA COMPACT. Perfect for HIKING, CAMPING and SPORTS like GOLF, TENNIS, FOOTBALL, SOCCER, SWIM or use at the GYM. Perfect Beach, Pool, Holiday Towel as it Comes with its own TRAVEL CASE. Specifically designed for the sports and leisure market, this towel is also ANTIBACTERIAL, meaning that it will STAY FRESH DURING your TRAVELS. The case and towel are equipped with a snap loop meaning they can be hung anywhere for easy usage or air drying. Whether you’re at the gym, hiking a mountain, off on holiday or just need extra space at home. 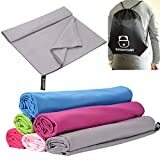 FREE DRAWSTRING BAG-Do You Need A Lightweight, Water Resistant Gym Bag That You Can Throw All Your Gym Gear In Quickly And Easily Hang Over Your Shoulder As You Go Out The Door?Now you can get one if you buy this towel. We are so confident in the quality of this product that we offer a 14 day no doubt refund. So GO FOR IT and order your Microfibre Sports Towel today!! 85% Polyester, 15% Polyamide Care Instructions – MACHINE WASHABLE at 30 Degrees. TUMBLE DRY LOW. Wash before first use.